The National Broadband Network (NBN) is not far off completion, and if you’re still not connected, it’s unlikely you’ll be waiting much longer. But if you’ve done some research, only to discover you’re eligible for a HFC connection, you might be wondering what exactly this means. Is HFC a good thing? How will it affect your speeds? And is it more expensive than other connection types? We’ve got all the answers below. HFC – it’s a three-letter acronym that has proven quite controversial in the internet space over the last couple years. So, what does it stand for, and more importantly, what does it actually do? HFC stands for Hybrid Fibre Coaxial, which is also colloquially known as ‘cable’. This type of internet has been available for some time now through Telstra and Optus, with both providers supplying cable internet to selected regions – mainly in city suburbs – for a few years. This cable is also used to connect pay TV services, such as Foxtel, to your home. NBN Co – the company responsible for the rollout of the NBN – has essentially purchased this cable from Optus and Telstra and has re-purposed it. If you’ve previously enjoyed a cable connection at your place, chances are you can continue to do, so as you’ll likely be connected to NBN Co’s HFC. 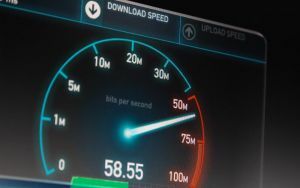 These old cable plans are capable of top speeds anywhere from 30Mbps to 100Mbps, but have traditionally been plagued by congestion issues that can severely hamper top speeds. With the NBN, there are over 120 points of interconnect (POIs), which use a fibre optic cable to connect to an NBN Node. From there the HFC cable connects to your home. In this regard, HFC NBN is similar to other connection types, but once it reaches your home, it’s a slightly different story – but more on that later. How much does HFC NBN cost? The good news is that even with a slightly different connection type, HFC customers are generally no worse off when it comes to NBN plans. Unlimited data can cost as little as around $40-$50 a month on the Basic Speed Tier, while for anything faster you can expect to pay at least $70 a month for unlimited data. Data-capped plans may be cheaper, but not markedly so compared to their unlimited data cousins. HFC is quickly emerging as one of the more popular connection types, especially in areas where there used to be Telstra or Optus cable internet. However, not all providers offer their services in HFC areas, so it pays to check before purchasing anything or getting too invested in a particular brand. What do I need for HFC NBN? Hybrid fibre coaxial NBN is a little different than other NBN types. 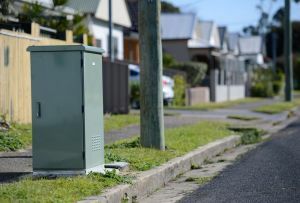 For new installations, NBN Co will supply a utility box and install it on the outside of your house, as well as a connection box inside your house. The inside box then connects to a coaxial outlet on your wall with a supplied cable. This box essentially acts as a modem. An NBN-ready router is still needed, connected to the inside box via ethernet cable. If you have cable TV such as Foxtel that uses this coaxial outlet, a splitter will be supplied by NBN Co to hook up both HFC and cable TV. From there you can connect VoIP services to your router as normal. Historically, the HFC rollout has been paused and delayed to ensure installation quality. However, even if HFC comes to your area, as with all connections, you have up to 18 months to switch before your old internet connection is turned off. This gives you time to think about the plan you want and any other considerations. How fast is Hybrid Fibre Coaxial NBN? HFC is capable of achieving top NBN speeds – 100Mbps downloads, and 40Mbps uploads. These speeds fall under the Premium Evening Speed tier of the NBN, and are the same as the top speeds found on other fixed-line connections. However, as with most connections, your top speed is influenced by outside factors such as the quality of cabling, congestion during peak times, and more. How far you are from the node can also influence how fast your connection can be; those within 700m can reach top speeds, while those that are outside this radius can only reach speeds of up to 60Mbps. Providers are required to test your line speed and check your location before putting you on a top speed plan. Different providers also buy different amounts of bandwidth from NBN Co, resulting in different results across every provider. One provider may purchase more bandwidth for faster plans, and others may focus more attention on the slower speed tiers. When determining which plan will deliver the best speeds for your home, there are a few things you need to remember. It’s important to pay attention to the ‘typical evening speed’ advertised, which can be more realistic about the type of speeds on offer. This reflects the average speed you can expect during peak periods. Peak times between 7pm and 11pm can experience a 20% slowdown of maximum speeds – for example, reducing your 100Mbps to 80Mbps or slower. Overall, it pays to read beyond just the price and how much data you receive. By scratching a little bit deeper, you’ll find not all providers are made equal! What are other types of NBN? FTTN – Fibre to the Node: Fibre runs to the node, and from there to your home traditional copper wiring is used. This is the most common connection type, and no special installation is needed. FTTC – Fibre to the Curb (Kerb): A relatively new technology, fibre is connected up to a small distribution point in a curb or street, and copper is used from there to the home. FTTP – Fibre to the Premises: The rarest of connection types, with gigabit-capable fibre optic cable run from the POI to the node to the home. FTTB – Fibre to the Building: A popular connection type among apartment buildings, which delivers fibre to the building’s communications room with existing cabling used from there. Existing cable type varies from building to building. Fixed Wireless: Consists of 2,600 transmission towers that use 4G cell technology, covering half a million residences primarily in rural or regional areas. A roof antenna is used to connect to a base station that then connects to 4G. Top speed is maxed out at 50Mbps. SkyMuster Satellite: Primarily for remote areas such as Christmas Island, Lord Howe and Norfolk Islands. There are two SkyMuster satellites offering in excess of 80Gbps capacity, with a satellite dish installed on the home. Top retail speed available is generally 25Mbps. As Australia’s largest infrastructure project in history, the NBN is no mean feat, and has so far proven to be a difficult and contentious project. 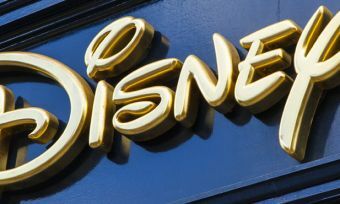 But if you ignore all the noise, checking your address with a retailer to see what’s available is all you need to figure out what type of connection you have. Should I look forward to HFC NBN? Ensure your router is up to date and that it’s capable of what the NBN has to offer; if it’s more than a few years old you may want to consider upgrading. Pick the right plan for you; it’s no use buying an expensive plan you won’t use, or choosing one that’s too slow or small for your needs. Keep in mind that you have up to 18 months to transition to the NBN before your old connection is turned off. Don’t let providers pressure you to change right away. Overall, you don’t have a choice if you’re connected to HFC internet or not, but if you have tried it and don’t like it there is no requirement to have an active broadband subscription. You can also look into the NBN alternatives to see if one services your neighbourhood. Be sure to shop around no matter your connection type before jumping into any old plan and compare different providers.